Owning a dog brings many joys and frustrations. For instance, in order to chaperone my dog from puppyhood into young adulthood, I have been forced to perform all of the following duties, sometimes simultaneously: listen to her plaintive wails while she was being crate trained, clean another dog's poop out of her face fur, brush her teeth, throw a tennis ball until my shoulder made a clicking noise, and watch the vet violate her with a rectal thermometer while she looked at me as if to ask, "Why are you allowing this to happen? Do something!" I've also had the pleasure of watching her chase her until she literally vomited from sheer dizziness without realizing that it may be a symptom of a very human problem. She may have OCD. "Dogs can have OCD?" you ask suspiciously as you watch your dog rearrange your bookshelf by color. 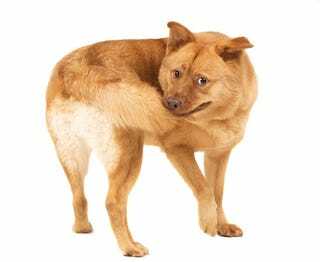 According to a study on canine compulsions published over the summer in the journal PLoS ONE, certain behaviors such as tail-chasing and snapping at invisible insects might be manifestations of obsessive-compulsive disorder. Study co-author Hannes Lohi, a professor of canine genomics at the University of Helsinki, explained that these compulsions are usually specific to certain breeds (like German shepherds, for instance). In order to figure out what was driving such seemingly compulsive behavior, Lohi and her colleagues distributed a detailed questionnaire to 368 dog owners in Finland (150 of the dogs in the study showed none of the supposedly compulsive behaviors and therefore served as the controls), and also collected blood samples from 181 of the canine subjects. Perminder Sachdev, director of the Neuropsychiatric Institute at Prince of Wales Hospital in Randwick, Australia, notes that humans, unlike animals, usually recognize these distressing behaviors and attempt to control them. Tail chasing, he argues, is more akin to stereotyped and repetitive behavior, which is often seen in people with autism. "I think that it is difficult to argue that tail chasing is a true model of OCD," Sachdev says. Lohi, however, plans to check further into dog-human connections in future studies. So dogs could suffer from anthropomorphic OCD, or they could suffer from anthropomorphic autism. The natural world abounds with mysteries.